Emirates has announced its fleet plans for 2016. In total, the airline will retire 26 aircraft, including twelve A330-300s, four A340-300s, one A340-500, six 6 Boeing 777-200ERs, two Boeing 777-300s and one Boeing 777-300ER. The average age of the Emirates aircraft slated for retirement in 2016 will be 15.7 years, well-below the average industry retirement age of 25. In addition, 13 more aircraft will be retired in 2017 and another 13 will be retired in 2018. Balancing its aircraft retirement programme, Emirates will take delivery of 36 new aircraft in 2016, including 20 A380s and 16 Boeing 777-300ERs. These two aircraft types are recognised as some of the most efficient and quiet commercial airplanes available, emitting on average 12% less carbon dioxide than the aircraft being retired. At the end of 2016, the aircraft retirements and new deliveries will put Emirates’ average fleet age at 5.6 years, dramatically younger than the global average. A recent analysis shows the average fleet age for the top five airlines in North America is 13.6 years, while the average fleet age for the top five airlines in Europe is 10.7 years. 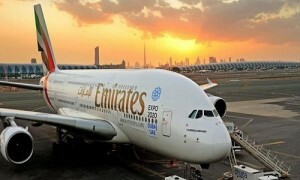 Currently, the total number of aircraft in the Emirates fleet stands at 243. In 2015, the airline received 26 new aircraft, including 15 A380s, 10 Boeing 777-300ERs and 1 Boeing 777 Freighter. The airline has 263 additional aircraft on order, worth over US$120 billion at list prices. Its order book includes 71 Airbus A380s, 42 Boeing 777-300ERs, 115 Boeing 777-9Xs and 35 Boeing 777-8Xs.